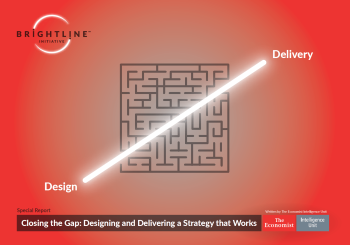 To understand why many organizations fail to bridge the gap between strategy design and delivery, The Economist Intelligence Unit (EIU), sponsored by the Brightline Initiative, undertook a global multi-sector survey of 500 senior executives from companies with annual revenues of $1 billion or more. This special report draws on the survey and additional in-depth interviews with 13 corporate leaders and academic experts. Strategy has little value until it is implemented. In a world where disruption can happen overnight, moving rapidly from strategy design to delivery is critical. Yet too many companies go only halfway, putting their best resources into design and in effect ending up treating delivery as an after thought. As a result, strategies fail, customers leave, key talent is lost and financial performance suffers. 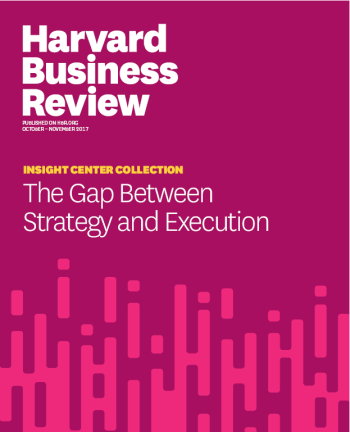 Yet many C-suite executives struggle with how to bridge the gap between strategy development and implementation. 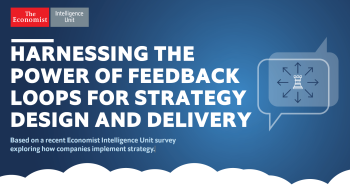 This EIU study, “Closing the gap: Designing and delivering a strategy that works”, draws on the survey and additional in-depth interviews with 13 corporate leaders and academic experts. The survey findings identify a group of companies—classified as Leaders—that report they fare best at achieving their strategic objectives. Most companies struggle to bridge the gap. 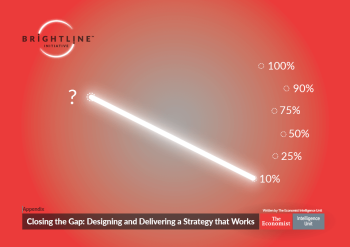 59% of survey respondents admit that their organizations “often struggle to bridge the gap between strategy development and its practical, day-to-day implementation”. On average, organizations fail to meet 20% of their strategic objectives because of poor implementation. No single barrier to success dominates the survey’s responses, and simple solutions to improve performance are not obvious. Yet bridging the gap is possible and the rewards are substantial. 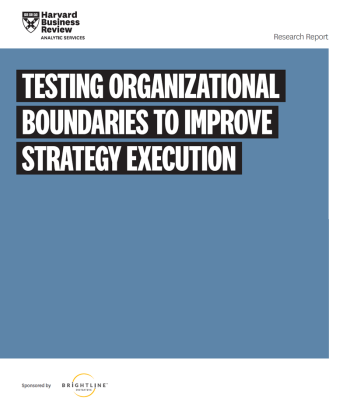 A small group, just one in 10, of survey respondents—the Leaders—report that failures in strategy delivery at their organizations, if they exist, did not impede achievement of any strategic goals over the last three years. These companies also significantly outperformed their rivals financially. For the Leaders, strategy design and delivery form a continuum, allowing both to evolve as conditions require. At these companies, strategy developers understand the challenges of implementation and the need for a capable and comprehensive delivery approach. 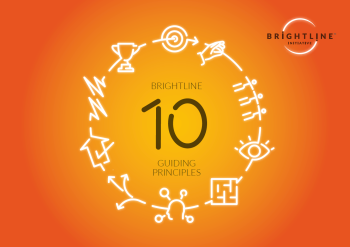 Information on the strategy itself and the progress of implementation efforts— including their impact on customers and markets—flows in a continuous feedback loop across these organizations. 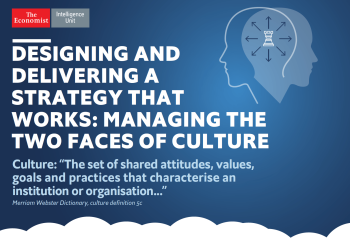 Leaders continually monitor their external environment and update both strategy and delivery as new information emerges. 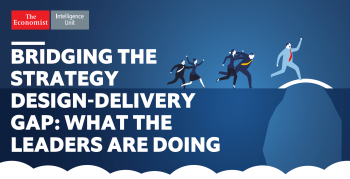 Although most survey respondents track trends happening around them, Leaders differentiate themselves in using that information to modify strategy delivery. In particular, Leaders engage those outside the formal boundaries of the company—especially customers and business partners—to help them reach their strategic goals. Leaders balance clear direction with responsiveness. The best companies combine a dynamic and flexible delivery capability with long-term vision. They are adept at moving quickly to make necessary changes while avoiding short term distractions and overreaction to transient shifts in the environment. A total of 500 senior executives participated in our survey, conducted in June and July 2017. Respondents all work for large companies: 48% have annual global revenues of $1 billion to $5 billion; 39% of $5 billion to $10 billion; and the remaining 13% of more than $10 billion. The survey sample is also senior, with half of respondents C-level or above and the other half consisting of senior and executive VPs, directors, and heads of business units and departments. Companies surveyed are geographically diverse, with 30% each from North America, Europe and Asia-Pacific and the remainder from the rest of the world. Finally, respondents come from a wide range of industries, with IT (10%), financial services (9%) and manufacturing (8%) the most commonly represented. 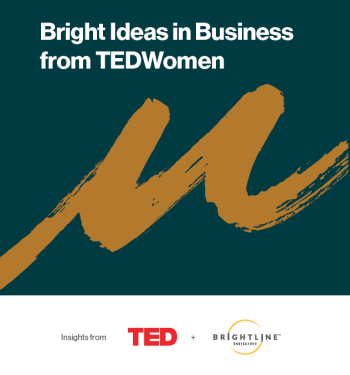 The analysis in this report and other output from this project also draw on the insights of interviews with 13 corporate leaders and academic experts, as well as extensive desk research. Don’t forget to download the appendix, a complimentary resource to this Special Report. It contains all charts based on the 25 questions from the survey.